ome of my clearest recollections of the Bronx involve the people wholived and worked in the neighborhood. People of different faiths and nationalities, first generation immigrants from Ireland, Italy, and European countries provided a human tapestry and gave texture to our lives. The Irish lived mainly in the “ghetto” surrounding the church; the Italians were mixed in here and there but dominated St. Dominick’s parish across the railroad tracks in the Van Nest section. Two very well maintained apartment buildings on Theriot Avenue were inhabited mainly by Jewish folks. I always remember the elderly among them sitting outside the buildings in their folding chairs, soaking up the sun’s rays as they watched the neighborhood in action. I wonder now how many of them might have been victimized by the Nazis. On summer evenings, after a day of street games, when the heat simmered down, we would await Stevie, the driver of the Bungalow Bar Ice Cream Truck, whose name became synonymous with his merchandise. When we heard the jingle of the bells on his truck, we would hurry home yelling “Can we have Stevie?”. 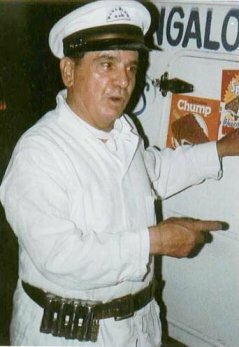 Stevie spoke with an Italian accent; he a wore a clean white uniform with matching cap and a change dispenser around his waist. Stevie seemed to like the kids who clamored around him shouting out “creamsickle” “dixie cup”, “orange ice pop”. There was a warm, patient, smile and twinkle in his eyes as he reached into the frosty interior of the truck and delivered the goods. I always wondered what Stevie did for a living in the winter and imagined that he headed for Florida in his truck. There was another Italian man named Frank who peddled fruit and vegetables from a horsedrawn wagon. He wore a battered hat and had a gruff voice. The neighborhood women in their housedresses inspected his offerings and maybe haggled a bit. Frank looked hard-working and harried and so did his horse, a large brown animal with a feed bag and blinders. I used to stare at that horse, the only live one I had ever seen. When the clomp clomp of his hooves reverberated down the street, to the next stop, I used to wonder where Frank kept him. Bronxites know that every neighborhood had its characters, sometimes people who became the object of harassment. We had Balaban “the crazy man” who lived with his wife and beanpole of a son, Ronald, in a single-family house on Thieriot Aveune. My mother had told us that Balaban’s mother hung herself in the basement which of course added interest. Poor Mrs. Balaban was mentally unstable and in the nice weather used to sit by the open door to their house, and yell obscenities at children passing by. The neighborhood boys, in their summer boredom, would taunt Mr. Balaban, who once ran into the street in his underwear, and menaced them with a long metal rod, javelin style. When I told my mother, her first and very real concern was whether I had “looked”, meaning did I look at his underwear. One spring day, my little brother Matty who had been playing on the sidewalk by himself was not to be found. Little kids could play on the sidewalk by themselves in those days but my mother was worried. She walked up and down the street and finally discovered Matty sitting on Mr. Balaban’s little patch of front grass, hardly a lawn, having a nice lunch with him, the both of them perfectly content. Maybe Balaban wasn’t a crazy man after all. There were people I recall because of their histories. Pat Clancy was a young man who had an unfortunate accident playing with fire and old paint cans in the “lot”, a vacant piece of property on Taylor Avenue which became a dumping ground, off limits to us, before it was transformed into a concrete playground. Probably more interesting as a lot, though, especially since it was forbidden ground. Pat suffered severe burns on his face, obliterating his features, concealing who he was inside. We could not see his smile, his frown, or his sadness and he must have been very sad. We couldn’t detect if he liked one of us girls and truthfully it probably never crossed our minds. Pat played handball with us and had friends. We accepted him and no one ever made fun of him. Years later I would hear that he died when he raced a train. A tragic life and a tragic death. The merchants included the butcher, the baker and maybe not the candlestick maker but the fish store, the various delis, and of course the candy stores. Who can forget the cold snowy days when we ended up on red stools anticipating our steaming hot chocolate topped with cream with maybe a cookie on the side. I always wondered if Mr. Kaplan, owner of the corner candy store on Tremont and Theriot, knew when we stole Tootsie Rolls. One of us would get his attention while the other swiped the candy, or we would buy one for a penny, while concealing others in our pockets. We knew it was wrong but I guess kids can’t resist seeing what they can get away with. At least it wasn’t the beginning of a life of crime. I must admit that I did do some shoplifting when I was twelve, under the influence of Kathleen K, a classmate. We also smoked in the Loew’s American in Parkchester where we risked wearing lipstick. We were also dumb enough to do this when Kathleen’s little brother was with us...and of course he told, and of course we subsequently lied. I remember when we both gingerly made cuts in our wrists and buried some little trinkets in a blood-sister ritual we had heard about. It is probably a good thing Kathleen moved to the suburbs. I was jealous of those families who were moving out of the Bronx and buying ranch houses on Long Island, or in New Jersey, or Rockland County, where there were lawns, backyards, dogs...they left the grit of the city behind them as well as their friends. I exchanged letters with a few but I never saw them again and sometimes wonder what became of them. Their families “traded up,” so to speak, to keep up with the Jones’s. Truthfully, when I look back, I am glad that our family stayed. The vitality of city life during those innocent and naïve years cannot be matched or repeated. The small town-ness we experienced, the street games, spontaneous visits from neighbors, are really a thing of the past. As much as we laughed about St. Anthony’s and the nuns, (Sisters of Charity - clearly a misnomer) we shared a certain terror as they walked down the classroom aisles in their black habits with crisp little bonnets. I was always intrigued by the fact that you could see their hair under the bonnets. And we wouldn’t have as many good stories now if we didn’t have the nuns. But that’s another memoir. I still get the urge to buy a “Spaldeen” and play points or hit the stick, or take a “trip around the world”. It didn’t take much to keep kids happy in those days. We didn’t want much except our skates, chalk, spaldeen, some scavenged items and each other. I wonder if kids still walk each other home. Some of those who remained in the Bronx until adulthood are lifelong friends. We still get together and laugh over the old days. We revert into Bronxese and revel in our shared bond. Life as we knew it in the Bronx has changed. My life has changed too. Now I have a lawn, a backyard, a husband, and a couple of dogs. Fortunately there are some sidewalks nearby, for old times sake. I still think “step on a crack, break your mother’s back” . As they say, you can take the girl out of the Bronx but you can’t take the Bronx out of the girl. So let us raise our egg creams in a toast!